There is no such thing as "item verification" or "item checking". Anyone coming to you saying you need to do this is guaranteed to be a scammer. 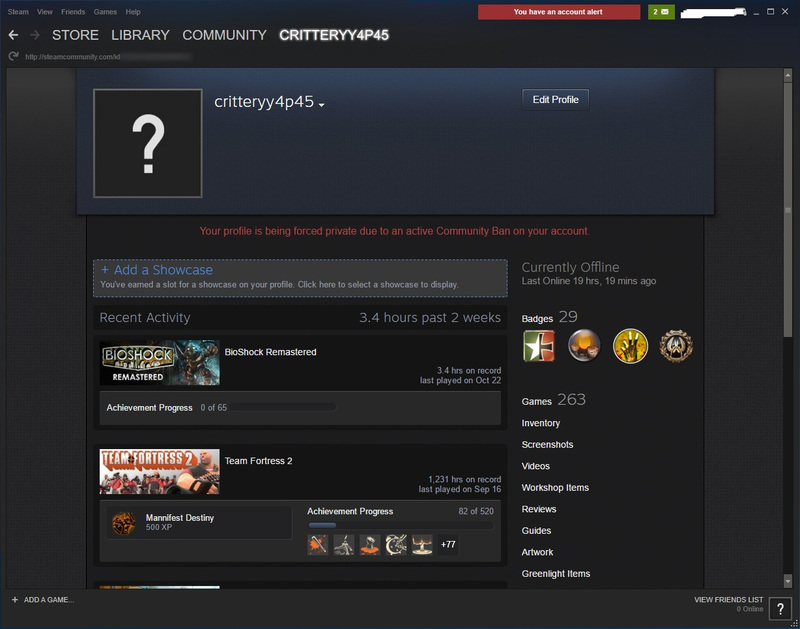 There are no "Steam admins" who get involved in trades either, and if you do what they say you'll lose your items. Please confirm who you are dealing with any time someone says they're an admin: https://steamrep.com/tips/pretrade. Don't trust any links in Steam or screenshots of anyone's "reputation" or "certificates". There is no such thing as a "pending" ban. Trade bans and other actions against fraud are immediate. If Steam Support thinks you're scamming, you won't see the ban coming, and it'll happen instantly. Scammers will sometimes claim that you have a "pending" ban that hasn't taken effect yet to scare you. If you don't already see a trade ban on your account, it's not happening; that's just something stupid scammers made up because they know they can't prove they're banning you. There is no such thing as "item verification" or "item checking". There is nothing wrong with your items, and more importantly, no item, regardless of its status, would ever require review by an admin. No, your items won't disappear, and no you won't get banned for having "illegal" items. That's a common ruse or social engineering pretext to make you do something unsafe. A little extra background for those not familiar: Dupes (or duplicates) exist, and to a lesser degree some glitches (usually more expensive collectors' keepsakes if they really exist), but those are not "hacked" or "illegal". Long ago, when Steam Support used to restore scammed items for hijacking victims, they duplicated the stolen items because it was impossible to reverse all the subsequent legit trades and market transactions carried out after each item was stolen. These "dupes", granted by Steam Support itself in recognition of innocent bystanders to fraud, will not get you in trouble with Steam Support. Some people devalue dupes for one reason or another, and I'm not going to get into the specifics of why, but any "checking" process to verify if an item is affected can be done without trading the items, using a website like csgo.exchange or backpack.tf with an item tracker. There is no such thing as a "Steam admin". The only people with admin access in Steam are Valve employees (Valve Inc. is the creator of Steam and CS:GO/TF2) and to some significantly lesser extent Steam moderators. SteamRep admins are not a part of Steam, and therefore don't have any special access in Steam. That said, what does a Valve employee's profile look like? Here is an example: https://steamcommunity.com/id/drunkenf00l/ and here's what you should look for. 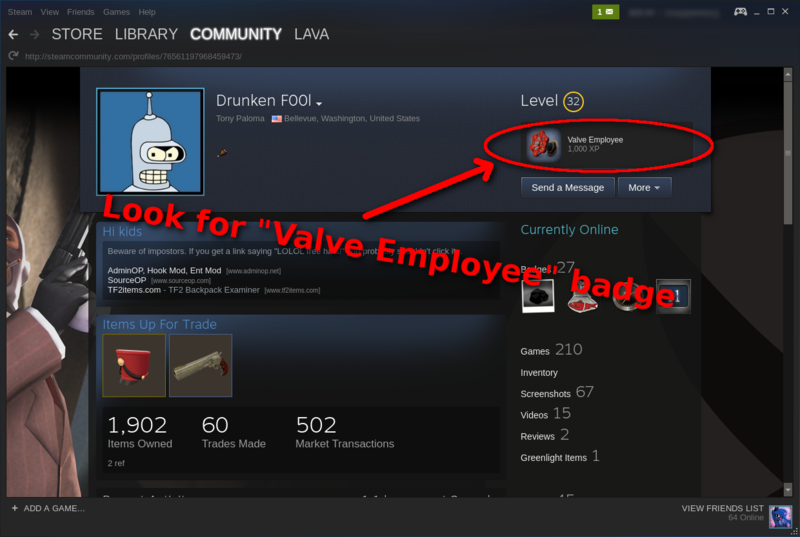 If you don't see the Valve Employee badge on their profile, they're not from Valve. SteamWorks Developers are not part of Steam either, and should not be trusted any more than another stranger on the internet. You can also confirm Valve employees by following these 3 steps for confirming admins, as Valve employees are recognized in SteamRep's database. There are no "certificates" or "licenses" for middlemanning or admining, and anyone presenting one is most likely a scammer. SteamRep is not a part of Steam or Valve. SteamRep.com is an independent 3rd party website, with a scammer database, but scammers love claiming to be "SteamRep admins" to make people trust them. In truth, SteamRep admins don't have any more special access in Steam than you do, so anyone using that to threaten you is lying. This also means SteamRep admins can't do anything special for trading (though you should read about middlemanning). If someone says they're an admin on steamrep.com, or even a Valve employee, follow these 3 steps to confirm. Then follow them again during any trade you commit as well in case a scammer inserted an imposter into the trade after you confirmed (it happens). If at any time you follow those steps, and you don't see an admin tag, you are 100% dealing with a scammer. Side note: If you have fallen for this and think you were scammed by an admin listed on SteamRep.com, follow these instructions. Valve never conducts official business in Steam chat. Chances are, you will never run into a Valve employee in Steam and chat with them. If someone from Steam Support needs to contact you, you'll receive a clear alert within Steam itself, which will look like this, at the top of the Steam window. If you do end up speaking with someone from Valve, they will NOT get involved in any of your trades. Why? Steam/CS:GO/TF2 or other in-game items are literally just entries in Valve's own database, not something tangible you'd have to give them. Valve employees can, if they have a reason, add, remove, or change items in anybody's account on their own without your involvement. If they truly needed to "inspect" your items, they wouldn't require you to hand them over. Nobody will VAC ban, trade ban, or otherwise punish you for refusing to follow their instructions in Steam chat. That's just a scare tactic used by scammers to rush you if they think you'll back away. If you feel uncomfortable with something for any reason, back away. Any legit admin or middleman will respect your decision to back out if you feel unsafe, and actually encourage you to listen to that gut feeling. Scammers sometimes resort to threats if they think they're about to lose a free knife. If Valve needed to talk to you about an impending ban, it would not be through a chat. It would be through either email, a Steam Support ticket, or by putting a big red "Message from Steam Support" banner in your main Steam window. Once you've traded away your items, they're gone. No matter what the "admin" told you, nobody but the scammer can return them. SteamRep admins don't have any special access whatsoever, so they can't intervene. Steam community moderators aren't able or allowed to touch any part of Valve's economy, so they can't do anything. Only Steam Support has the ability to do this, their policy is they don't return scammed items. Ever. If someone tries anything listed in the above points, don't try to trade anyway. No matter what kind of deal they're offering, or how sweet the deal is, there is no profit for you to make. That awesome deal you're trying to finish never existed, and the scammer will rather block you before letting you profit. The people doing this are usually professional criminals who do this for a living, and have been doing it for years. No matter how stupid they seem, or how great the deal looks, the only thing they are really interested in is getting your item(s) for free by tricking you into doing something unsafe before the trade. See also: What does a middleman do?